You may remember Alex Jones‘ amazing LEGO Transformers that we featured in action recently. Now Alex has teamed up with builder Joachim Klang to create a book called Tips for Kids: Transformers: Cool Projects for your LEGO Bricks. 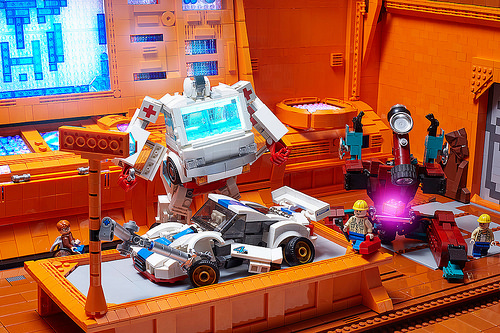 In this preview for the book, which is scheduled for release in July, we see a Medi-bot repairing one of the Autobots with help from Teletraan I, the semi-sentient computer that runs the Autobots’ spaceship and base of operations, the Ark. Much like his other builds, the attention to detail here is magnificent. A fantastic creation enhanced with creative lighting and a little Photoshop editing around that pink holobrick. All these ingredients help to bring the robots in disguise to life in LEGO form. If you want to see more of these wonderful images, good news: the book will have over 200 pages, and is available for pre-order right now.